The day prior to Commencement, Katie Couric, CBS Evening News anchor and long time supporter of colon cancer research, visited Sanford “Sandy” Markowitz, MD, PhD, Ingalls Professor of Cancer Genetics, and Howard Hughes investigator, and his research team in his lab to gain a better understanding of the day-to-day research necessary for advancements in colon cancer. Dr. Markowitz and his research team provided Couric a warm welcome, a tour of the lab, and hands-on experience and insight into the kind of research conducted inside the Markowitz lab. Couric and Dr. Markowitz have worked together for years in an effort to improve colon cancer screening and ultimately find a cure for the disease. Couric helped launch the National Colorectal Cancer Research Alliance, a foundation that raises awareness and funding for colon cancer research, after her late husband, Jay Monahan, succumbed to the disease in 1998. 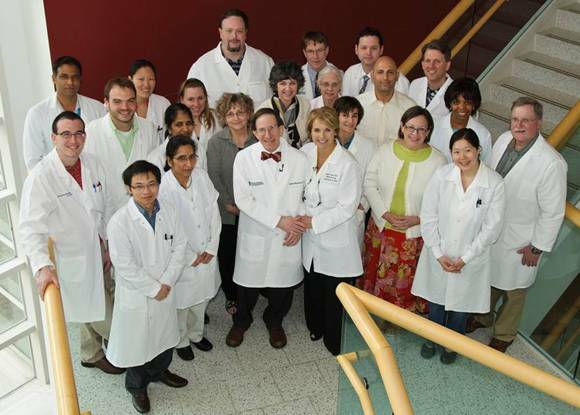 Katie Couric visited Sanford “Sandy” Markowitz, MD, PhD, professor and researcher of cancer and genetics, and his research team in his lab to gain a better understanding of the day-to-day research necessary for advancements in colon cancer. The CBS Evening News with Katie Couric anchor and managing editor received a warm welcome from the researchers, who provided Couric with hands-on training. They also informed her of the various research projects being conducted in the Markowitz lab at Case Western Reserve University Department of Medicine. The touching visit brought together Couric and Markowitz, who have been working together for years to improve colon cancer screening, and ultimately the disease. Couric’s late husband, Jay Monahan, succumbed to the disease in 1998. Couric went on to help co-found The Entertainment Industry Foundation’s National Colorectal Cancer Research Alliance, which has raised awareness and funding for colon cancer research.